T-shirts are ubiqitous, and here in the Bay Area you can get away with wearing one to any occasion…probably/possibly/maybe. Whatever your style, there are millions of designs from independent designers to cheap-chic chains like Target. Still despite it’s humble roots as *gasp* undies, the t-shirt seems to be stirring up a bit of a class war between indie designers and big biz. Local designers Mark Lee Morris and Andrew Soernsen of Taylor + Turk recently claimed in a San Francisco Chronicle article that the reason behind starting their line was their “disgust” of fake business t-shirts mass-produced by corporations. Tut, tut, boys! Those t-shirts didn’t design themselves…they were probably designed by an inhouse designer with the same jaded passion for design that the rest of us have. Sure, the designer might have been coaxed into ripping off a design that someone else did, but that’s another story. Anyway, I’m an equal opportunity t-shirt buyer….and the Taylor + Turk t-shirts are pretty cool. Plus, since many independent designers use American Apparel t-shirts, you can feel confident that the only “sweatshop” labor is that of the designers themselves. 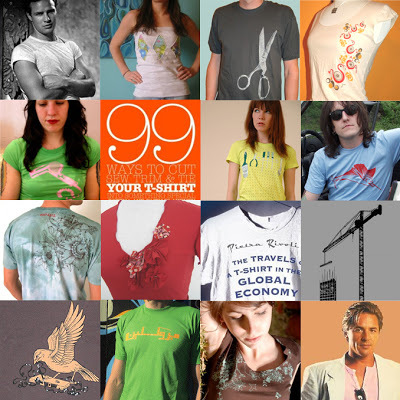 : Book: “Travels of a t-shirt…” want to know where your t-shirt really came from? : Oh, Don, you did wonders for the tee by suiting it up and rocking it out in Miami Vice!